Santa Fe's hotel and tourism industry blames populist Mayor Debbie Jaramillo for the slowing of the city's upscale boom. 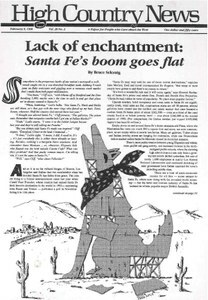 The writer describes how his New Yorker father fell in love with, and eventually moved to, Santa Fe. The "war of words," started by wise users and taken up by environmentalists, needs to end in a truce and a turn to non-violent language. Two Cove-Mallard protest veterans offer a light-hearted list of dos and don'ts for those facing arrest for civil disobedience. Despite a depressed market, Green Mountain Mining Venture asks the BLM for permission to open the Jackpot uranium mine. Essayist Ann Ronald and photographer Stephen Trimble celebrate Nevada in the book "Earthtones: A Nevada Album." U.S. Fish and Wildlife issues a draft propoal that would allow the agency to remove the wolf from the endangered list before environmentalists think it is recovered. Photographer Carole Gallagher profiles the West's downwinders and atomic veterans in a show and lecture in Denver, Colorado. The Environmental Working Group publishes a pamphlet describing how a proposed "takings" law in Washington was defeated. The Forgotten Pollinators Campaign seeks to warn Americans about the decline of honey bees and other pollinators. Klamath Basin Bald Eagle Conference in Klamath Falls, Oregon. Great Salt Lake Issues Symposium, an educational forum, held Feb. 10. Catron County, N.M.'s land ordinances survive an environmental lawsuit, but fail to be enforced on the ground. New Mexico State's Range Improvement Task Force issues a press release saying the Diamond Bar allotment is not overgrazed, and environmentalists and scientist critics cry "pseudoscience." Republican challengers race to fill the seat abandoned by retiring Democratic Rep. Pat Williams. Idaho environmentalists fight with the state Land Board over leasing parcels for conservation instead of grazing and win a court victory. Researchers study the elusive wolverine and discover new facts about the animal's range, numbers, social life and sexual behavior. A captured Canadian wolf destined for release in Idaho is killed after biting a biologist's thumb. A coalition of animal rights groups and Indian tribes stops New Mexico from staging buffalo hunts on the decommissioned Army depot Fort Wingate. Rancher Jim Maitland rescues an injured golden eagle in southwestern Oregon. Floatboaters object to Republican Sen. Larry Craig's bill allowing powerboats unlimited access to Hells Canyon.